Learning Butoh is rich and deep, that´s why it takes a longer time to study it. Stefan Maria Marb developed in his last 25 years of negotiating with butoh his personal style. In his lessons contrary movement qualities like fast-slow or soft-hard are essential. Strong emotions and inner pictures will be consciously perceived and can simultaneously be transformed into the outer space by the working body. Dancing Butoh our mind, our consciousness and our body are in an immediate harmony of time and space. The origin of this dance lies within of ourselves and we need a specific consciousness, to transport our body-pictures from our inside to the outer unlimited space. Learning butoh there are no limtations of age, beauty or perfection. 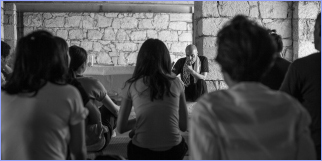 the aim of his teachings are instead of to search for an authentic body expression, to develop your own butoh.